Recently the hubby and I, as well as our fantastic neighbors Ken & Kathy, made a quick overnight getaway to the Merida area. 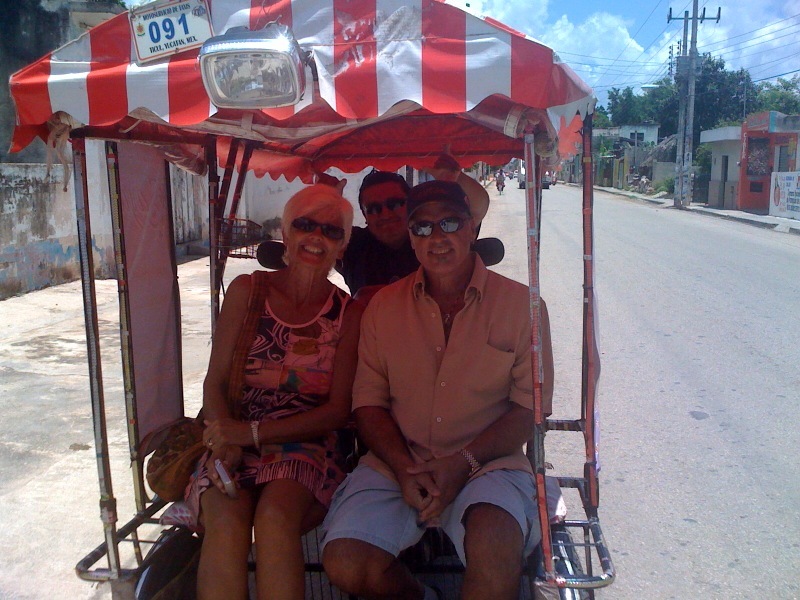 I really can't encourage you enough to EXPLORE the Yucatan! Your options are endless, affordable, and fantastic!!! We set out early Saturday morning and visited the town of Ticul. Ticul is the Yucatecan Mecca of Leather Sandals and Pots. In fact, they are so plentiful and reasonably priced, that we had to go back the following week with a truck to pick up our purchases! 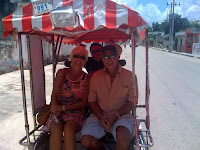 In order to find "the good shops" we hired two local bicycle taxis to take us on a tour and show us the pottery shops. If you are in Ticul (about an hour south of Merida) you want to find what I called "Pot Row". It's a street full of family pottery shops with their wares on display in the front and their kilns baking their creations in the back. Mixed in and between the smaller shops are also two larger shops worth visiting: Arte y Decoración and Arte Maya. 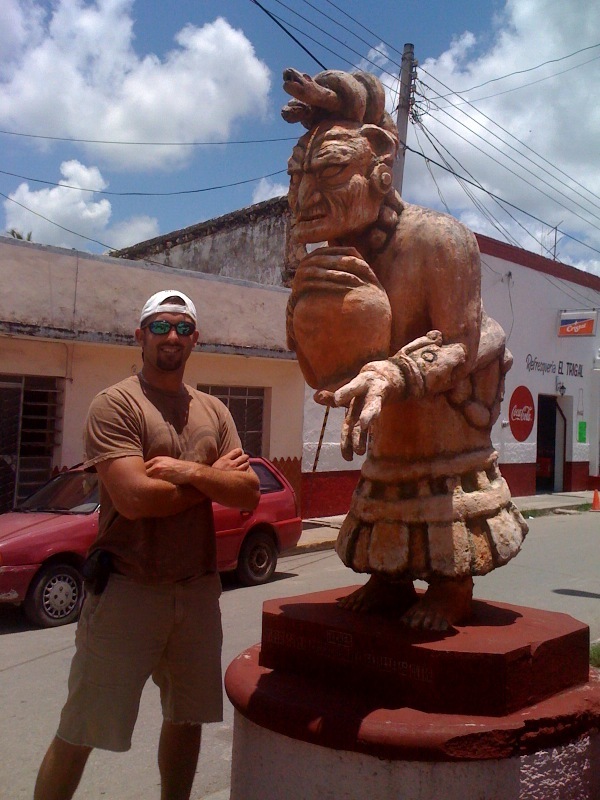 Arte Maya's creates detailed, museum quality replicas of Mayan Pottery and Carving. Their shops is filled with plates and pottery; larger works can be commissioned. It's definitely worth stopping in to have a look-see -- even if you only are browsing! After Ticul, we visited Hacienda Xcanatun for a lovely dinner in an absolutely incredible location! The Hacienda Xcantun is a refurbished, luxury hacienda with spectacular rooms, beautiful grounds, and a super scrumptious restaurant, Casa de Piedra. We enjoyed peppers stuffed with cochinita pibil, tamarind chicken, and other dishes filled with Yucatecan flavor! Then, we enjoyed dessert and the guys finished cigars out on their back terrace. Super Great Night! 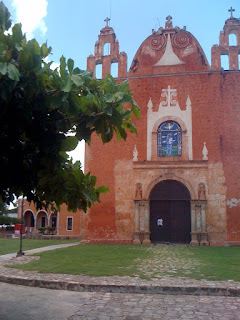 The Hacienda is on the outskirts of Merida, not far from the Centro -- and definitely worth it! After stuffing ourselves with the yummy delights of the hacienda, we turned in for the night at Casa Mexilio, a bed and breakfast located in the Historic Colonial Centro of Merida. The quirky guest house features stairways and corridors arranged in the most outstandingly complex fashion that allows each guest their own entrance, privacy, and space. I toured the place thoroughly and still couldn't grasp the floor plan. The home is filled with colonial antique furniture and offers a simple but good breakfast to its guests. After breakfast, we headed to the town of Dzitya to visit its annual Tunich Artisan Fair. Wow! The little town of Dzitya is just on the northern outskirts of Merida (quite close to Hacienda Xcanantun). The park is surrounded by shops offering beautiful wood carved and stone carved pieces of art. During the fair, the artisans display their best pieces. Incredible, Beautiful, and Reasonably Priced Works of Art! We brought home a beautifully carved decorative wooden vase and another vase painted in Mayan design. And......I can't forget to thank the men at the 15 Peso Piña Colada Booth!! You guys made the heat bearable. We had SEVERAL --- 15 pesos?!? A Forgotten Treasure -- Just waiting for a crazy like me to buy it and restore it!